You can hear a wasp by the distinct buzzing sound it creates when flying. Visually a wasp is 10-15mm long and has a black-and-yellow striped body. They have a painful sting, which unlike bees they can use repeatedly. The queen wasp is larger at 20mm. She hibernates over winter, making a nest in the spring in which to lay her eggs. Three to four weeks after laying her eggs the grubs develop into female worker wasps. Workers forage for over a mile in search of food. One nest may produce 30,000 wasps in a year. 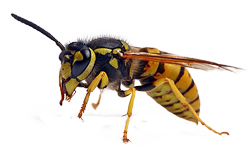 Wasps are most prevalent in August and September and become a nuisance as they seek out sweet food and liquid. A Wasps sting can be very painful and should be treated with antihistamines to reduce the swelling. To treat your wasp problem quickly and discreetly get in touch.